Four graduate students, four disciplines, but one transformative experience. Emily Colón, anthropologist, Alison Thieme, studying remote sensing, Matthew Aruch from International Education Policy, and zoologist Katie Murtough (‘17 MPP/MS, Public Policy/Cons Biology) met through a field course in the Amazon Basin. Entitled, ‘Conservation, Indigenous Peoples, and Sustainable Development’ the three-week innovative interdisciplinary program offered each scholar the opportunity to engage with the protected Kayapó Indigenous Territories in the Brazilian state of Pará in collaboration with the Kayapó community of A’Ukre, the Kayapó led NGO, the Protected Forest Association (AFP), and FUNAI, the Brazilian government agency responsible for Indigenous affairs. Thieme had spent a few years focused on forest monitoring and conservation, but had given little attention to the people and communities that live in the Amazon. With the Kayapó, she learned more about the human dynamics in the forest and their impact on the environment. In fact, the immersion experience was so profound that Thieme shifted the focus of her research to include the importance of indigenous groups when discussing conservation in the Amazon. “I witnessed the strength of a Kayapó community and their ability to protect huge sections of forest. Indigenous communities in the Amazon are responsible for land and natural resource management in much of the Amazon basin. Being there, I was able to verify that the low deforestation rates on Kayapó lands matched what I was measuring with satellite imagery,” remarks Thieme. Aruch was already interested in experiential learning, sustainability, and Indigenous knowledge by the time he went to Brazil. His research also intersected with the focus of the Kayapó program. In 2014, anthropologist Janet Chernela, originator of the course, asked if he had an interest in assisting her. Aruch jumped at the opportunity and has since been working on program administration, curriculum development, and instruction. “The course is not only a learning experience, but a sustainability project in itself, assisting the A’Ukre Kayapó with economic revenue streams. In the last few years, this course has been the centerpiece of my Ph.D. studies as I study the partnerships between A’Ukre and their network of university, NGO, and government partners. In February 2019, I will spend nine months in Brazil on the Fulbright Student Research Award. I am particularly interested in how the different actors view this program as a model for how education or research may be an effective intervention for forest conservation and Indigenous livelihoods,” says Aruch. Murtough is now a doctoral student at the University of Oxford, with a focus on Zoology and Ethno-ornithology. Her interest in the Kayapó was through a public policy and conservation lens, but in the end, as for all participants, the experience was more than just academic, it was life changing. She is now doing research on the ecology of the Amazonian hyacinth macaw in the Kayapó territories and documenting the community of A'Ukre's traditional ecological knowledge of local parrot species. “I have returned each summer to A'Ukre as an intern to work on various community and conservation projects of value to the Kayapó,” says Murtough. This summer, the program celebrates its 16th anniversary. Chernela, who has a long history of collaboration with the Kayapó and environmental conservation justice, invited Kayapó leaders Paiakan and Kuben-i to a conference on conservation and indigenous environmental knowledge while a professor at Florida International University in Miami. The conference became the first step in a longer series of meetings between the Kayapó, representatives of North American environmental NGOs, members of U.S. Congress, and Executive Directors of the World Bank, which resulted in the World Bank pulling funding from a hydroelectric dam project that would have inundated Kayapó lands. The success of the Kayapó in this David-and-Goliath struggle was hailed by indigenous advocates throughout the world. At a celebratory meeting in Altamira the following year, the tropical forest ecologist, Barbara Zimmerman, met Paiakan. At the time Zimmerman was working with Conservation International and concerned about the logging of hardwoods from Amazon forests. When Zimmerman visited Paiakan in his village, A’Ukre, and witnessed the near-extinction of mahogany, they developed a plan that would simultaneously protect important mahogany reserves and also bring income to the Kayapó of A’Ukre. In 1992, they inaugurated Pinkaiti, an 8,000-ha ecological research station within A’Ukre’s territories. Pinkaiti began to attract researchers and students from all over the world. In 2000, Chernela was asked by The Nature Conservancy to suggest a possible ecotourism project. Over the next two years, Chernela and Zimmerman met with 14 Kayapó villages to discuss the possibility of a university field course in which community members of A’Ukre would be equal partners. By that time, Chernela was an Anthropology faculty member of the University of Maryland. In 2004, the first UMD Kayapó field course took place. 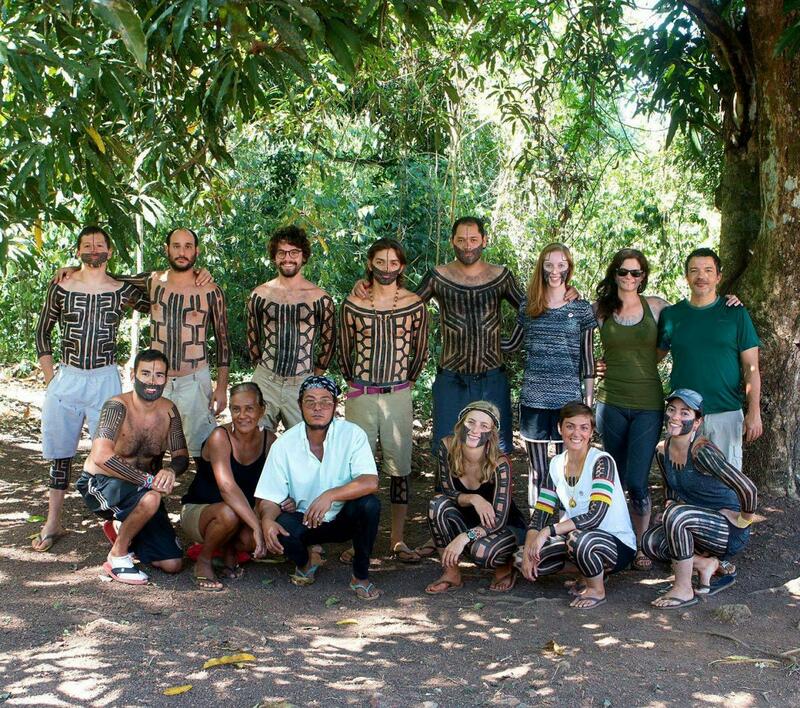 It was led by Chernela, a tropical forest ecologist (Zimmerman), and participating Kayapó. By 2006 the leadership included two anthropologists (Chernela/Laura Zanotti), two tropical forest ecologists (Zimmerman/Adriano Jerozolimski), and an ongoing team of Kayapó. Since then, the course has continued to build strengths in both ethnological and ecological orientations. It now partners with a Kayapó-led association, Brazilian universities, and a parallel course offered by Zanotti at Purdue University. A high point was reached in 2018, when Kayapó Chiefs Krwyt and Kaket of A'ukre, Jerozolimski from AFP, and the writers of this story, held a panel discussing the course at the International Congress of Ethnobiology. The lesson in here is this. No matter the discipline, partnerships lead to greater human understanding, and awareness of important global issues. Colón, Murtough, Thieme and Aruch, Chernela and many others, through the Kayapó collaboration, have perhaps altered the broader academic discourse simply because they said ‘yes’ to looking deeper. “The human rights and environmental issues faced by the Kayapó Peoples are of global concern and will need a level of global action that will span academic disciplines and require the support of informed citizens. In this way, the Kayapó, themselves, are our true professors and regardless the reasons why any one of us initially went to Amazonia, we left their land as more informed citizens and stewards of this planet,” concludes Murtough. For more information about the UMD program in the A’Ukre community (July 17-August 7, 2019): http://ter.ps/sumbrazil or contact Dr. Janet Chernela (chernela@umd.edu)/Emily Colón (ecolon@umd.edu).